Later topic: Is It Bad To Keep Things Locked Up? Those sheet fingers are usually phenolic with a spring steel backer, though I have seen some made entirely of spring steel. I don’t believe they are available any longer, but it couldn’t hurt to ask Fritz. As I understand it, those fingers, in conjunction with the star wheels, keep the sheets from flopping down onto the form and/or rollers and getting a stripe of ink on the end of the sheet. They were broken on my SP-15, and I DIY’d replacements using scraps of polymer. Works good. If Fritz doesn’t have the parts, you could try it. You might also try seeing if you could get the Heidelberg sheet separator (which is available from NA graphics among other places) to work for that application. It’s the same basic shape. NA Graphics no longer has the friction fingers. Not sure about the brackets and backer. We have made replacement fingers for our three Vandercooks. We do indeed have the SP-15 friction fingers—made in spring steel. Maybe I’ll get them on our web site Tuesday. Just got back from Ladies of Letterpress in Mt. Pleasant so have a few things to catch up on. 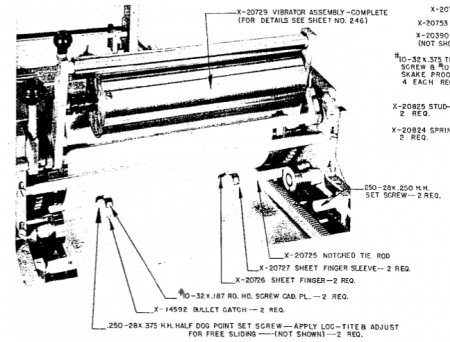 Many, actually most, of our Vandercook parts are not on the web site because there are too many of them—just ask.